The new Panasonic Toughbook H2 is the newest in the series of rugged tablet PC,s made by the company. Coming from the previous version the H1, we can see a few improvements in the H2 but still maintaining the product's life circle with most peripherals being compatible with both the H1 & H2. The new improvements in the H2 includes the enhanced intel® core i5-2557M (1.7 GHz) and 4GB RAM from previous 2, which is expandable to 8 GB with a standard 160 GB from previous 80 with an optional 128 GB SSD. The H2 is specifically designed for mobile field workers, offering more rugged feature with its HDD casing which has the ability to withstand a few drops and an anti scratch coating, making it one of the toughest Tablet available in the market today. As part of performance improvement, the new H2 includes the Panasonic quick boot manager which helps reduce boot up time and offer up to 6.5 working hours with its twin hot swappable lithium batteries running on windows 7. 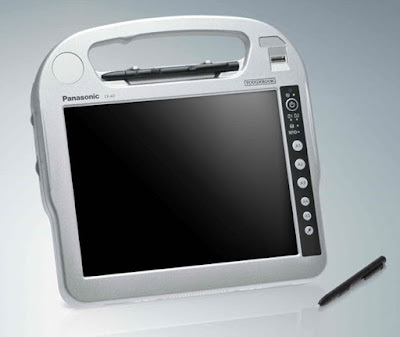 For improved connectivity the Toughbook H2 offers WLAN, Bluetooth, 3G and an optional GPS for navigation.